Sun Corridor – Interstate 10 (I-10) is the southernmost east-west, coast-to-coast Interstate Highway in the United States. It stretches from the Pacific Ocean at State Route 1 (Pacific Coast Highway) in Santa Monica, California to Interstate 95 in Jacksonville, Florida. A major expansion of Interstate 10 is presently underway that will provide additional lanes in each direction through central Arizona. Interstate 11 is a critical piece of multi-modal infrastructure that will support and connect the economies of Arizona and Nevada. It also could be connected to a larger north-south transportation corridor, linking Mexico and Canada. The purpose of I-11 is to provide a high-priority, access-controlled transportation corridor that has the potential to enhance movement of people and freight, facilitate regional connectivity, trade, communications and technology. Interstate 8 (I-8) is an Interstate Highway in the southwestern United States. It runs from the southern edge of Mission Bay at Sunset Cliffs Blvd. in San Diego, California, almost at the Pacific Ocean, to the junction with Interstate 10, just southeast of Casa Grande, Arizona. In California, especially from eastern San Diego County to points east, Interstate 8 runs very close to the United States-Mexico border. At points in eastern Imperial County, the border is no more than two miles (3 km) south of the Interstate. The Union Pacific Railroad tracks run parallel to Interstate 10 across the state of Arizona, and therefore, pass right through the Sun Corridor region which extends from Phoenix metro area down to the Tucson metro area. In fact, many of the Industrial Parks within the cities of Casa Grande, and Eloy have direct access to rail service. Union Pacific Railroad operates North America’s premier railroad franchise, covering 23 states in the western two-thirds of the United States. The railroad links every major West Coast and Gulf Coast port and provides service to the east through its four major gateways in Chicago, St. Louis, Memphis and New Orleans. Additionally, Union Pacific operates key north/south corridors and is the only railroad to serve all six major gateways to Mexico. Union Pacific also interchanges traffic with the Canadian rail systems. Union Pacific rail system is perfectly positioned to serve the country’s fastest growing cities and states. The railroad is the nation’s largest hauler of chemicals and one of the largest inter-modal carriers. The railroad has one of the most diversified commodity mixes in the industry, including chemicals, coal, food and food products, forest products, grain and grain products, inter-modal, metals and minerals, and automobiles and parts. 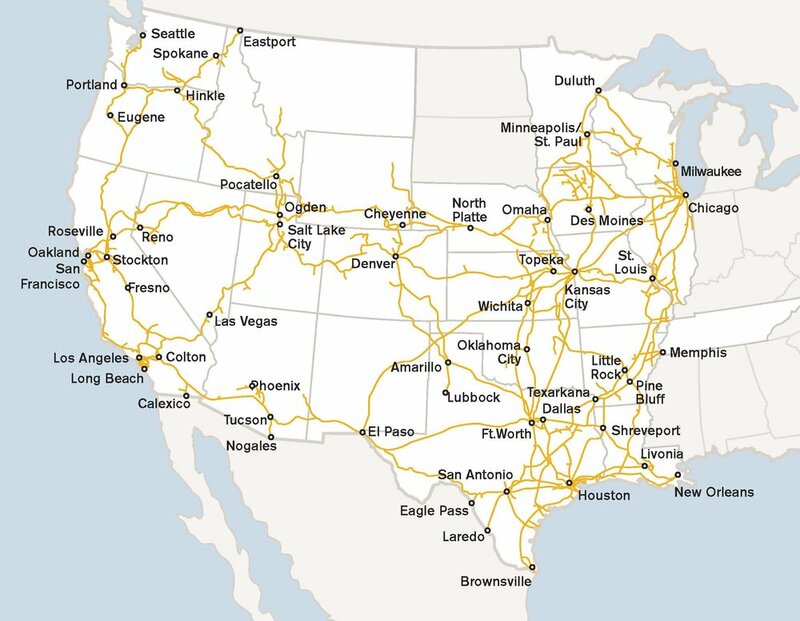 Through Union Pacific's connection with other Class 1 railroads, Union Pacific provides a complete network of rail connections throughout the United States. The central Arizona region is strategically located within the state of Arizona with one hour access to two International Airports: Phoenix Sky Harbor and Tucson International. These airports are available for industries that regularly need access to the global markets. Phoenix Sky Harbor International Airport is approximately a 45-minute drive from the Pinal Alliance region off of the Interstate 10. Phoenix Sky Harbor International Airport is one of the ten busiest in the nation and among the top 20 busiest in the world. Phoenix Sky Harbor serves more than 120,000 passengers, with 1,500 flights per day, and a daily economic impact that surpasses $106 million for the Phoenix metro area. Fly anywhere in the world from Sky Harbor with easy connections or fly nonstop to more than 85 domestic locations and 19 international destinations. Phoenix also provides service to over 100 domestic destinations non-stop. Southwest Airlines has major hub operations in Phoenix, providing convenient connections to virtually any city in the U.S. Due to excellent weather conditions, Sky Harbor closures average less than two hours per year. The Tucson International Airport is approximately a 60-minute drive from the Sun Corridor region off of the Interstate 10.Tucson International Airport’s 7 carriers offer over 91 daily nonstop departures to 15 destinations with connections worldwide. The airport averages 82 flights per day from 12 airlines. 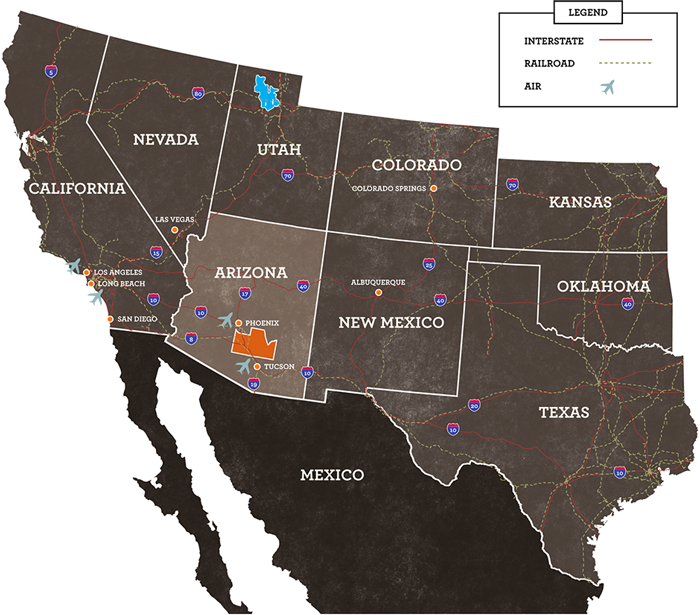 Central Arizona is currently supported by 4 regional airports located in the cities of Casa Grande, Eloy, and Marana, ranging in different sizes to fit many different needs. Current usage at the airports ranges from personal small aircraft usage, National Guard training, airline repair, parachute training and the nation’s largest drop zone. Many opportunities exist for aviation related businesses. Many of the airports have existing land available for industrial and aviation industries. Pinal Airpark covers 2,080 acres and has one primary runway and is the home of Evergreen Aircraft Maintenance Facility and Silverbell Army Heliport (SAHP). The Western Army National Guard Aviation Training Site (WAATS) and other numerous National Guard units are located inside SAHP. The WAATS is used principally for all ARNG AH-64 Apache Attack Helicopter training by the ‘Gunfighter University’. Pinal Airpark also hosts the U.S. Special Operations Command’s Parachute Training and Testing Facility. Pinal Air Park, Marana, Arizona Marana Aerospace Solutions, formerly known as Evergreen Maintenance Center, is a Federal Aviation Administration (FAA) approved FAR Part 145 repair station with an FAA Class IV Airframe Rating (#ERKR675D). In addition to the FAA certification, Marana Aerospace Solutions is ISO 9001-2008 registered, holds maintenance certifications from Aruba, Bermuda and EASA. The organization offers various levels of aircraft components, paint and maintenance on Airbus, Boeing, Embraer, Bombardier, Raytheon and McDonnell Douglas aircraft. The Western Army National Guard Aviation Training Site, (WAATS) is located at the Silverbell Army Heliport Marana, Arizona, in the heart of the beautiful Sonoran desert. The heliport is about 30 miles Northwest of historic Tucson and about 86 miles South of Arizona’s capital city of Phoenix. Co-located at the heliport is the 1st/285th Apache Helicopter Attack Battalion, a unit of the Arizona Army National Guard. The pre-mobilization mission of the Western Army National Guard Aviation Training Site (WAATS) is to conduct National Guard Bureau directed aviation training for the Attack and Aero-Scout mission as approved and directed by the US Army Training & Doctrine Command. The post mobilization mission is to augment the TRADOC as an activity under the command and control of US Army Aviation Center. The WAATS is the premier training site for attack and aero-scout helicopter training for the Army National Guard. The training site also serves both active duty and National Guard aviators with simulation support, utilizing the AH-1 Flight Weapons Simulator or the AH-64 Combat Mission Simulator. Helicopter emergency procedures training is being conducted at the Picacho Stage field, which has a control tower, crash fire rescue and four emergency procedure-training lanes. In addition, Picacho Stage field is able to bivouac an entire Apache battalion. The Casa Grande Municipal Airport is located in the city of Casa Grande, south and west of Interstate 10 and west of Arizona Highway 387. The airport is owned and operated by the City of Casa Grande and occupies approximately 640 acres. The Casa Grande Municipal Airport hosts several aviation events between December and April. The existing facilities include a paved runway (05-23), three major taxiways, apron and tie-down areas, hangars, a lighted wind sock, segmented circle and rotating beacon. Runway 05-23 has a Medium Intensity Runway Lighting System with precision instrument markings for Runway 05 and basic markings on Runway 23. The Casa Grande Airport maintains a reputation as one of the most business friendly airports in the west and maintains an airpark master plan that facilitates for new industry for the future. Available lots consist of traditional light industrial properties as well as sites that sit on the runway allowing for direct access to the runway. For more information on available industrial sites in the airpark, contact us. Home to Skydive Arizona, the nation’s largest skydiving drop zone, Eloy Airport is owned and operated by the City of Eloy. Runway 2-20 has a 2 box visual slope indicator, runway end lights and no obstructions. Hangars and tie downs are available for lease. 24 hour self service fueling is also available.